I was instructed to use Everclear for this recipe. I repeatedly asked if we could use vodka because I knew it'd be easier to obtain and less expensive but the answer was no every time. Why use alcohol for this recipe? Alcohol is the solvent that produces the strongest and most effective herbal medicine possible. It also preserves the medicine for 20+ years. Placing the medicinal drops in water and allowing that to sit for a few minutes will allow 90%+ of the alcohol to evaporate. Where do I purchase the Everclear? Check your local state liquor store. If they do not have the larger, 1.75 liter bottles but only have much smaller bottles, you'll need to order it in from through your local state liquor store OR purchase it out of state. We have found that Colordao and Arizona sell the full 1.75 liter bottles of Everclear but most other states do not. Note: Some states do not sell the Everclear at all. What strength does the everclear need to be? The strength of the Everclear should be the 190 proof. California DOES NOT sell the full strength Everclear. Californian's CAN purchase the 151 proof Everclear HOWEVER the recipe will need to be changed slightly. If purchasing the 151 proof Everclear, you WILL NOT dilute the Everclear down for the herbs that need to be diluted down to 75%. For the herbs where the Everclear needs to be diluted down to the 50% solution, you'll dilute your 151 proof Everclear down by 25%. You'll need to figure out those calculations. AND please make note that if you're purchasing the 151 proof Everclear, you'll need to purchase more bottle of the Everclear than what is specified in the recipe. You'll need to figure out how much more to purchase. I have not figured out those calculations at this point. How do I dilute the Everclear? This is a pretty straight forward process. Don't worry about getting it exactly precise. For the 50% solution I use a larger clear pitcher and pour an entire jug of everclear into it, and then add "almost" an equal amount of water. This will get you pretty close to a 50% solution. I then mark the pitcher with a marker so that it is easier to see how much water to add. For the 75% solution I use the same pitcher, add the amount of water specified in the recipe. Then mark the pitcher again to make it easy to add the right amount of water without having to use a measuring cup each time. If you would like to make dilution calculations based on other proofs of alcohol, this site has a helpful calculator. Is it legal to purchase liquor out of state? We haven't come up with any concrete evidence that suggests that it isn't legal to purchase Everclear out of state. Purchasing and SELLING liquor out of state is what is illegal. Please do let us know if you find information that contradicts this info. What if I want to use Vodka instead of Everclear? Everclear is what was I was instructed to use. If you choose to use vodka, pray about if this is the right choice. If using vodka, I'd highly recommend using the 100 proof vodka and then increase the dosage amount to what feels right to you. By using vodka, you will not get as strong of a remedy. Please leave a comment in the comment section below if there are any other topics I should clarify regarding the topic of the EVERCLEAR that would be helpful to others as they make the recipe. I was told that if one cannot find Everclear, Moonshine is 190 proof and could be an alternative. Guess it depends on where you live and what your resources are. NH has Everclear. It is $34 per 1.75 litre bottle. Privately owned stores in MA do not seem to have it, only the State run stores in NH have I been able to find it. Here is a link that discusses dilution and has a chart explaining it. 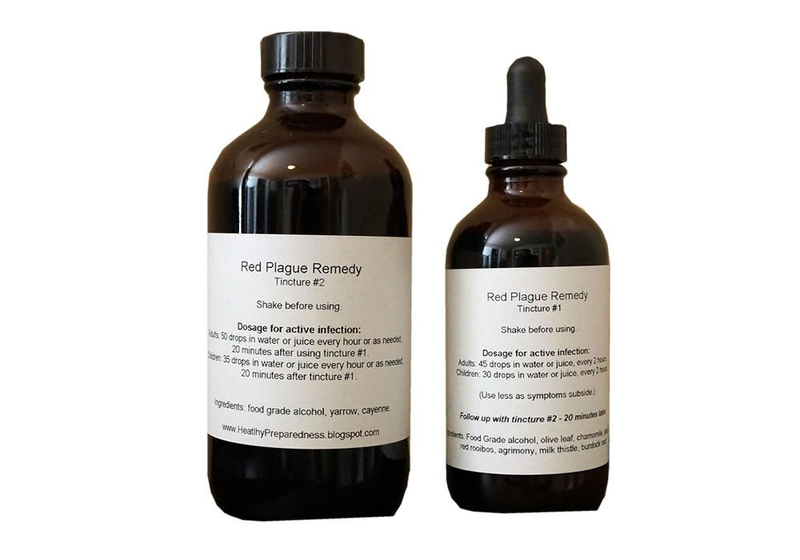 This blog has been put together to help answer questions about the tincture making process for the Red Plague Remedy. If you've made the Red Plague Remedy, please do share your feedback and tips so we can help others in the tincture making process as well. The medical information on this site and handout is provided as an information resource only, and is not to be used or relied on for any diagnostic or treatment purposes. This information should not be used as a substitute for professional diagnosis and treatment. Please consult your health care provider about a specific medical condition.